/ Windows / Is Your Window Box Damaging Your Home? When it comes to fixtures for patio doors and windows, window boxes are always a great addition whether you have a classic or contemporary American home in Cincinnati. They can be filled with colorful flowers and vibrant shrubbery to bring some character to an otherwise flat and boring window sill. If installed properly, your window boxes shouldn’t have much effect on the surrounding parts of your home. 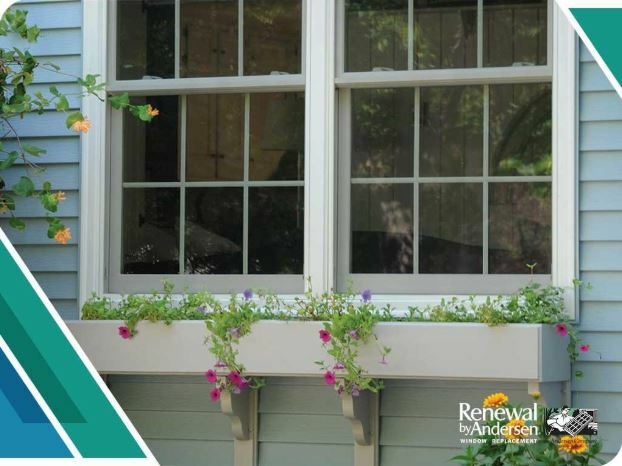 As the most trusted replacement window and door company in the area, Renewal by Andersen® of Cincinnati offers the following tips for your window boxes. Aside from water, the box itself can also show signs of physical damage. Minor issues can be fixed easily with a few DIY solutions, however, larger problems must be addressed by a professional contractor. This includes leakage and rotting. If the window box is in close proximity to other parts of your home such as double-hung windows or sliding patio doors, dirt can also get trapped within the tracks, preventing the sashes from moving. Unwanted water can lead to all sorts of problems, particularly to wooden fixtures. With a window box, the stools and aprons of your windows are the most prone to water damage. These are the lower parts of the frame on the opposite side of the windowsill. Ask your specialist for a special channel to draw water away from the windows and into a proper drainage site. Alternatively, you could also opt for Renewal by Andersen’s exclusive Fibrex® frames. Unlike most other wooden fixtures, this durable wood composite is impervious to rot. Choose from a full range of top-quality wood composite replacement windows, sliding and French patio doors, and more only at Renewal by Andersen of Cincinnati, your number one trusted window replacement company. Give us a call at (513) 283-8981 or fill out our online contact form to schedule an in-home consultation and request a free estimate today. We serve homeowners in Cincinnati, OH and all nearby areas.